TGF Release Day and a CHA Relay!! This is NOT a race, LOL. You will have through tomorrow (3 Feb) at NOON CST to complete your card, so our overseas friends have plenty of time to play, too! Here's MY card for today's relay! 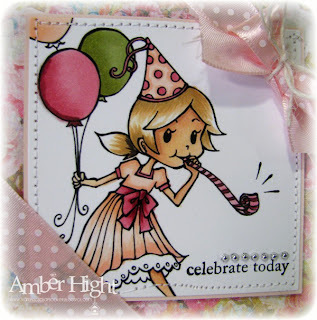 I used one of the new stamps from the UBER fab Miss Anya "Hat's Off"! These are just the SWEETEST lil Missy's! She's very punk, I love that, lol! The papers I used are from BG's Bittersweet, my favorite paper of at the moment;) I did lots of *STITCHING* on my card (I also thought about Faux stitching or Paper Piercing...cause those would work too *wink*)! I always do, and I love the extra texture it adds:) I also used some PTI ribbon and buttons and my favorite silver pearls! SCRSC #28 and a FUN announcement! Here's my card using the super fun Celebrating Chloe!! 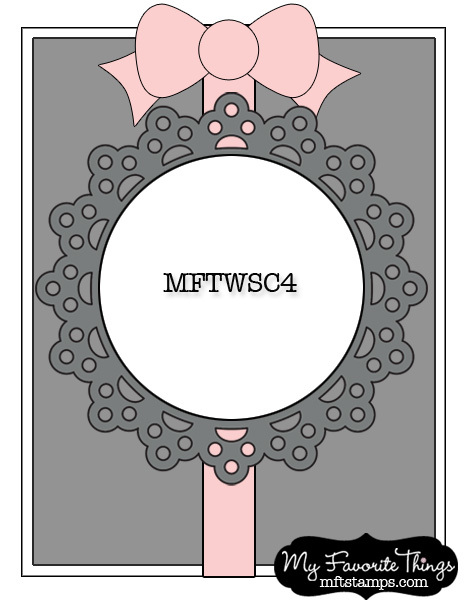 I finished it off by sewing it on a piece of pink cardstock and adding some pink ribbon! Want to play along? Create YOUR "It's a Girl Thing" card and upload it on the SCRS blog HERE! Here are the design team blogs, you definitely want to see what they've come up with for this challenge! TGF Sneak Peeks, Day 3--Cheeky Howdy! Hiya, girlies! It's MONDAY! Time to get back into the weekly routine, right? I sort of like Monday's now that I'm not working, I can get up at 8:00, have my coffee, check the email and surf around for awhile, and do some reading! I'm reading a new (to me) series called Immortals after Dark and am on the 1st book (well the 2nd if you count the prequel book, I read that one already). It's good so far!!! So you didn't come here to hear me drone on about my day, did you? LOL! Today is another sneak peek at a new Cheeky! Meet Cheeky Howdy! After I colored her, I embossed the image with my PTI Woodgrain Impression Plate. I love how it looks! The sentiment is from "Anya Says". 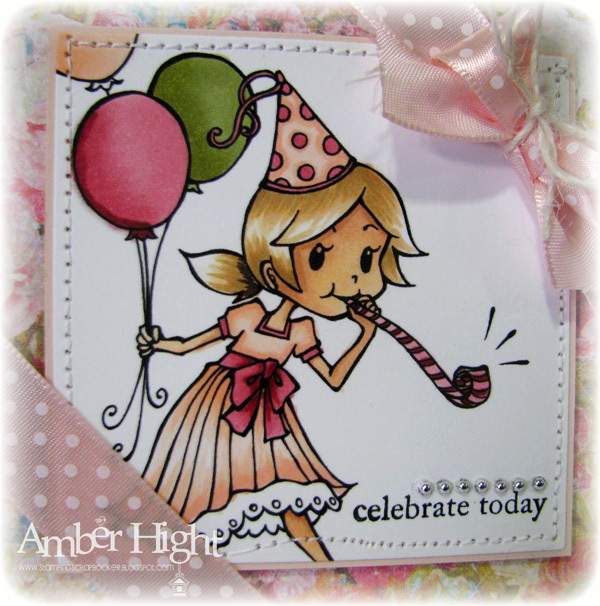 I was wondering what I could use this card for and then thought it would make a fun "Congrats" card so when I find someone to send it to, I'll stamp a "Congratulations" sentiment inside:) The papers are from Wanted by Basic Grey! **Okay, now for some DETAILS! You have until 11:59 CST time TONIGHT to leave your comments! Good luck! Don't forget to stop back by tomorrow, both teams are having an UBER fun CHA Relay game, you don't want to miss it! In true TGF fashion, it will be a BLAST!!! See you tomorrow...same bat channel, same bat time! Saturday Sketch with a PREVIEW!!!!!!!!!!! Hi there friends!! 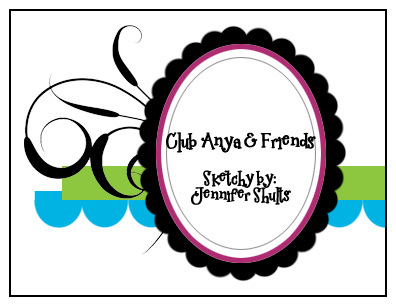 Today is Sketch Saturday on the Club Anya & Friends blog but today we have a surprise!!! We're previewing a NEW Cheeky!!! I must say, she is super fabulous and SO cute! Meet "Cheeky Chat"!! The papers are from October Afternoon, I forgot if it was Thrift Shop or Modern Homemaker? 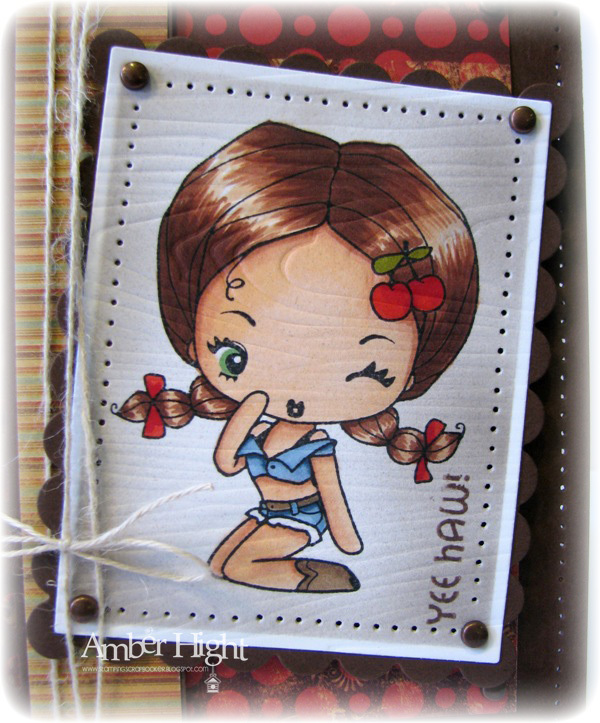 So today, Team Anya AND the Farmers played along in the sketch and everyone is previewing this FABULOUS stamp that will be released with 2 other sets on Tuesday, February 1st! Farm Fresh Friday-Hat's Off to You!!! Always exciting here on the Farm! And now onto the Challenge! This week, we invite our friends and customers to join us in our "Hat's Off to You!" 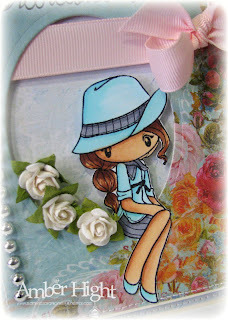 challenge!...use a HAT theme on your card or project! 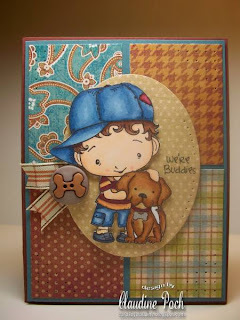 You can cut one out/alter a stamp, use Hat paper, hat racks, hat pins, baseball caps, anything to do with HATS on your challenge card. You can also create a 3d/altered item in the shape of a hat? Whatever you fancy, it's hat's off to you this week! With that in mind, the DT has a sweet surprise for you today! As SOON as I saw this image, like .25 seconds later, I thought "OMG she looks like Fleur Delacour from Harry Potter!!!" Am I right or what?? 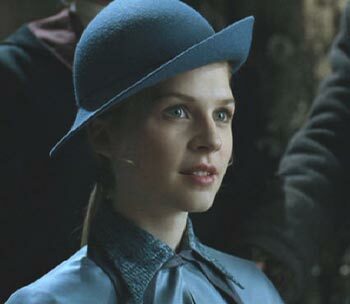 I think she's one of my favorite images ever because I love Fleur's character! So graceful and innocent, just like Miss Anya:) I got some new Prima paper pads this week and this one, called Annalee, is my favorite! This pariticular pattern too! As soon as I saw it, I knew I wanted Miss Anya to be sitting in this sweet little flower garden! 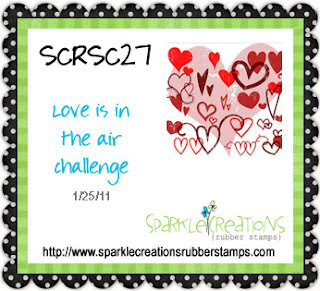 I played in the Sparkles Creations challenge again this week! The challenge is an easy one, whatever makes you think of love! 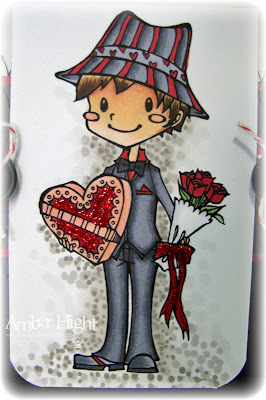 Valentine Oliver makes me think of Love! Isn't he precious??? Especially carrying these chocolates and flowers to his beloved:) I kept the layout and embellishing to a minimum so he could stand out in all his CUTENESS! I colored him in grays and reds and did some stippling with a W3 and W5 Copic. That's it from me today, I'm not super chatty! We're watching that SyFy show "Face Off" where the make up artists compete kinda like Top Chef only the create movie characters and stuff. Fun show! I'll be back here tomorrow with the first day of our TGF Sneak Peeks!!!!!!!! You do NOT want to miss this release, FUN STUFF in store for you, including a CHA relay on release day!! I sorta wish I could play, lol! Hey there, it's me again, lol! 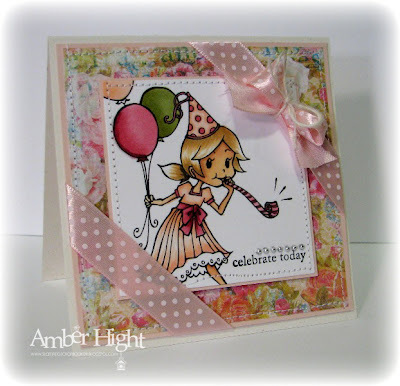 This is my 2nd post today, please scroll down or CLICK HERE if you want to see my MFT Sketch challenge card;) Thanks! If you haven't heard yet, we're mixing things up over on the Verve blog! You may remember our previous theme called "Project Parade". We've renamed it the "Diva Dare" to make it less intimidating and more fun! Basically, we're issued a "Dare" and we answer it with whatever we're feeling at the time:) Doesn't have to be a large project or anything, it can be a card, a tag, a bookmark, an altered piece, whatever your heart desires! It's ALL good! 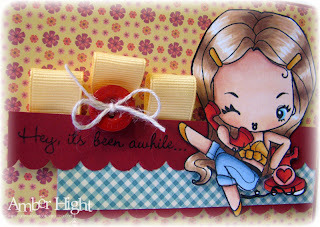 I'm up on the blog today, and here's my project! I wanted to do something a *little* different, so I cut about 1.25" off the card front for some visual interest and then hung the sentiment panel off the side! I colored the animals from To the Moon and stuck 'em behind the Smallest Things PJ panel, I think they're so cute! 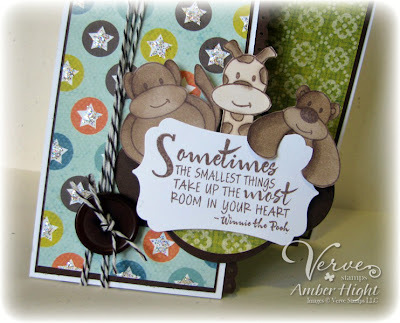 It's mostly covered up by the animals, but the sentiment panel is built on top of the Classy Label die. 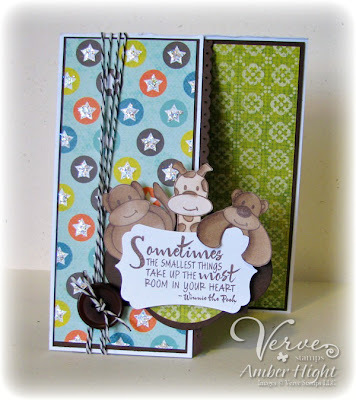 The sentiment was cut out with a label punch by EK Success. 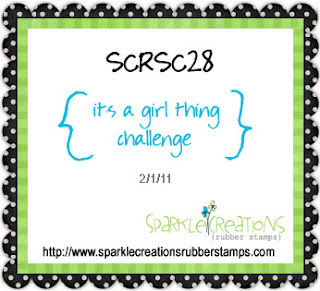 Like I said, this challenge is open to everyone so CLICK HERE for details on how to play! Hello and Good morning! 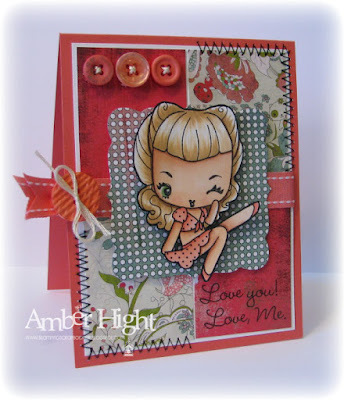 I have a fun new card to share today:) I got my new A la Mode stamps just in time for this weeks Wednesday sketch Challenge on the MFT Forums at SCS! My favorite of the new A la Modes is this one, called Oh Baby! I colored the image in with Copics to match these LUSCIOUS papers from KaiserCraft's "Lush" collection and finally got to use my fabby Decorative Doily Die-Namics! I love that big doily, it's gorgeous and so fun! It's big too, this card is 5"x5" so that shows you how big it its! 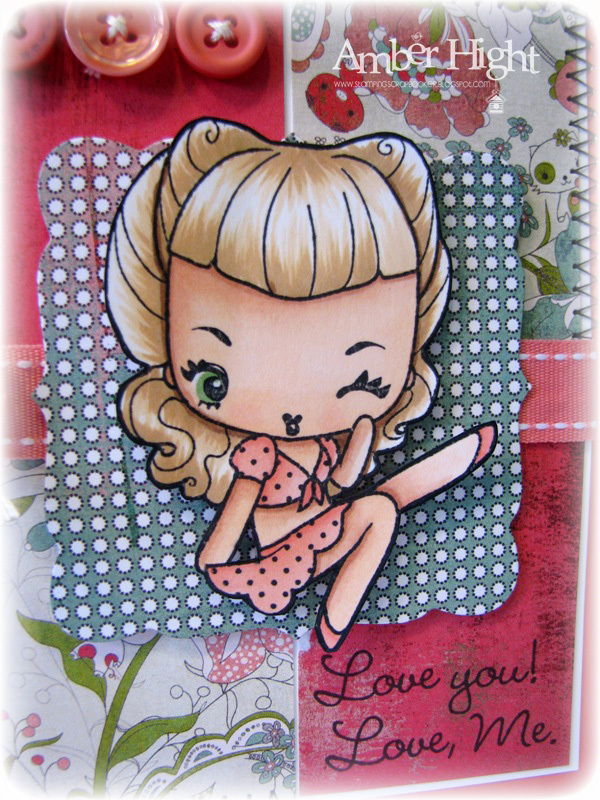 Well that's it from me for now, I'll be back in a couple hours with my Diva Dare project! Hello! How are you today, my friends? I had a WHOLE day of crafting today and it was FABBY! I worked on alot of preview cards and my Diva Dare for tomorrow (have you been visiting the Verve blog and checking out all the Diva Dares so far? Check 'em out HERE! ), and then tackled this week's Mojo Monday sketch! 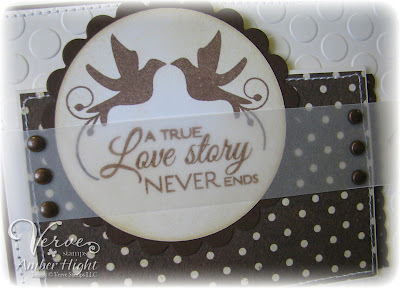 Here's my card using Love Story by Verve Stamps! I didn't have very good lighting today, but did my best in Photoshop, lol! Instead of that horizontal piece going UNDER the circle, I wanted to use Vellum and stamp my sentiment on it, so I added it to the top of the circle! I also didn't know how I was going to attach it and decided on brads:) I think this may be the card I give Billy for Valentine's Day! I don't know where I'll put all this paper though, I'm running out of room!! Thanks for stopping by today! I'll be back tomorrow with more VERVE!!! Hello! 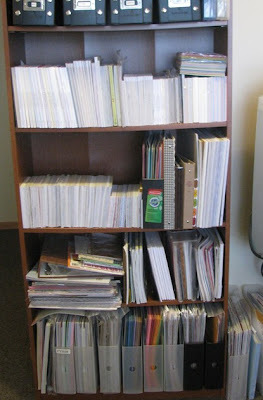 It seems like every time I turnaround, I'm writing my MM post, lol!! The weeks are FLYING by! 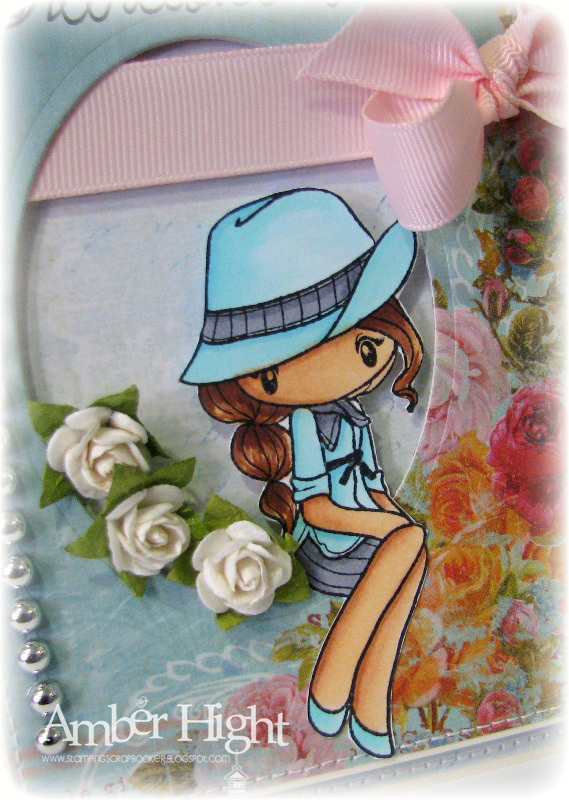 For this week's Mystery Monday, we're CASE'ing this beautiful card by Claudine!! 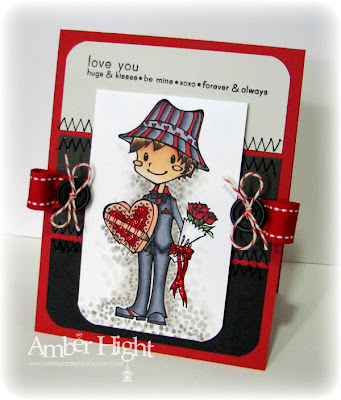 I love the fun layout and cute little ribbon embellishment on the side! 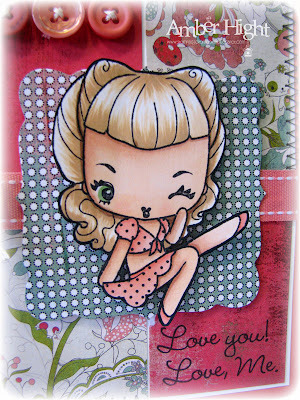 Here's my card using Cheeky Rockabilly! The designer papers are from Basic Gray's "Olivia" line! Check out my fabulous team mates to see what they've come up with!! If you'd like a chance to win a FREE stamp, just for playing along with us, head on over to the CA&F blog for details!!! Mojo 174-Love + a tutorial + storage tips! It takes a LOOOOOONG time to grow young! Mystery Monday featuring Kim the Paperbabe!! 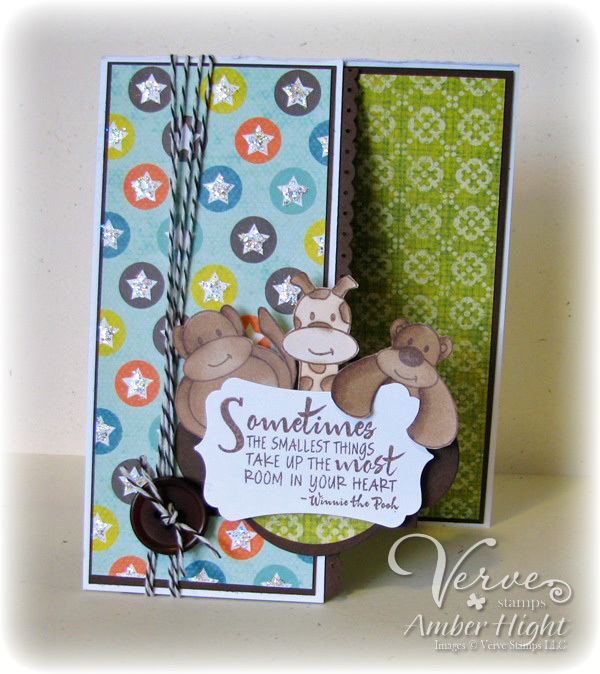 Verve Sneak Peeks, Day 3 ~ To the Moon! 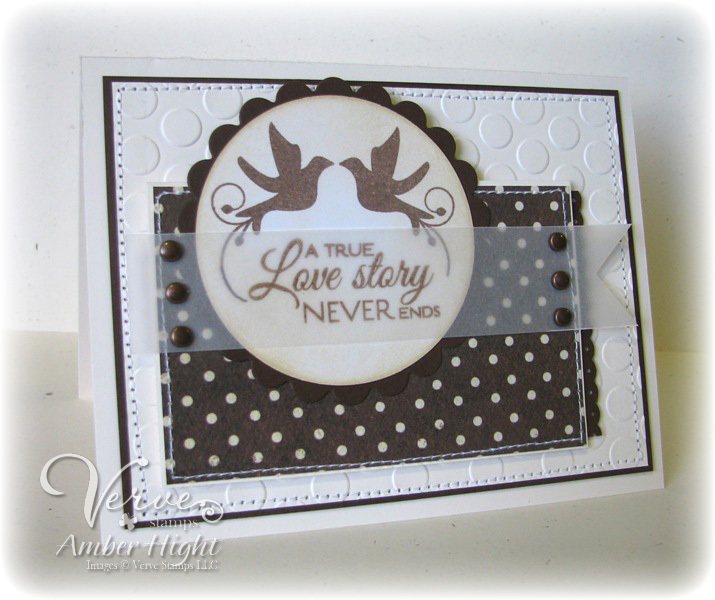 Verve Sneak Peeks, Day 2 ~ Love Notes!